Deputy Chief Justice Owiny Dollo has decried the increasing cases of crime in the country. File photo. The Court of Appeal yesterday (Friday) kicked off a month-long special criminal session in Jinja district. A panel of judges, including lady justice Hellen Obura, Justice Remy kishke and Justice Cheborion Barishaki, will handle cases that include murder, aggravated defilement and robbery. 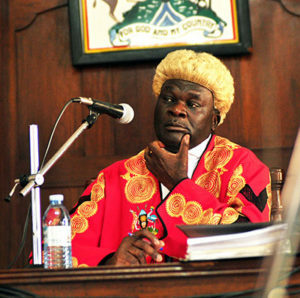 According to the Deputy Chief Justice Owiny Dollo, the move aims at reducing case backlog and costs for both appellants and the judiciary, among others. Jinja covers appeal cases from the districts of jinja, Iganga, Mayuge, Luuka, Namayigo, Buikwe, Namutumba, Bugiri, Kamuli, Buyende and Kaliro. While opening the session at Jinja High Court today, Dollo decried the increasing criminality in the country, especially involving murder. In a related development, a list released recently shows that murder cases dominate the list of appeals being handled in the Criminal Session that kicked off on Tuesday, February 6, at the Supreme Court. The list shows that out of the 16 appeals and two applications for review to be handled during the session that concludes on February 22, nine are murder cases involving 10 people whose sentences were upheld by the Court of Appeal. Other appeals against the decisions of the Court of Appeal are in cases of aggravated robbery, robbery and defilement.